On December 19, at around 9:30 p.m., a distraught young woman climbed onto the wall near the Battery Park City ferry terminal, apparently ready to jump into the icy water. 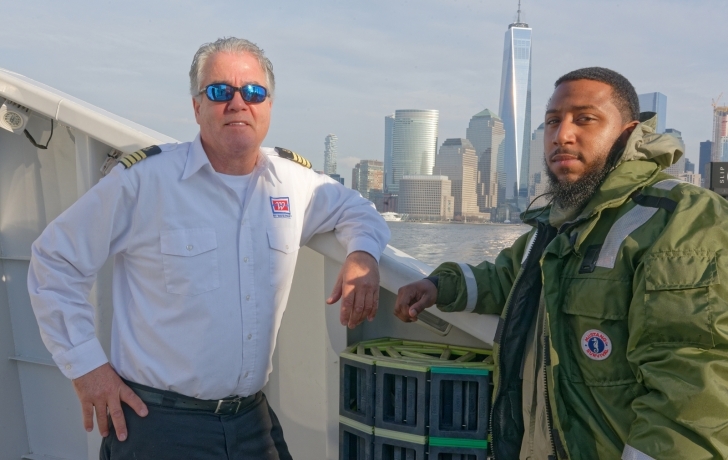 NY Waterway crewmembers and two ticket agents helped thwart the potential tragedy: Capt. 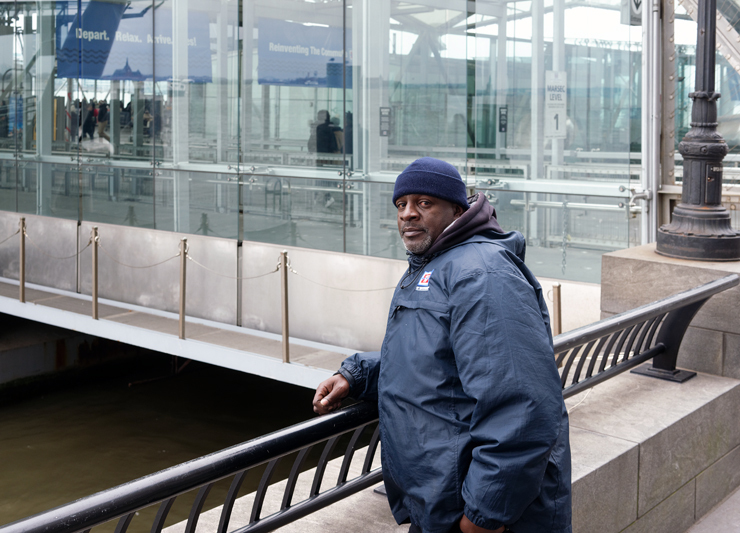 Ken Recine; dockhands Travis Brumfield and Roberto Valdez Garcia; ticket agent Anwar Khalifa; and Aaron Hutchinson, an off-duty agent waiting for a boat to take him home to Jersey City. Here's how three of them recall that night, as told to the Trib. Capt. Ken Recine Before we left for the Paulus Hook terminal in Jersey City, Travis pointed out to me that there was someone sitting in the terminal who was upset. After we came back, he told me she was crying and that her head was down, and he didn’t know if she was drunk. I said keep an eye on her, and he went up and told Anwar [Khalifa] in the ticket office to watch her as well. The tides were kicking, it was full moon. Me and Roberto approached the captain, asked him to call Harbor Charlie [the NYPD harbor patrol]. In the meantime, Aaron [Hutchinson] went over to calm her down. Capt. Ken Recine When we came back she was on the wall, screaming. The dockhands immediately put on life jackets. We did protocol. We backed up, and I pulled the boat over by the wall and were ready to deploy whatever we had to. I positioned the boat where, if she did end up in the water, we’d be able to get her out. We have life saving equipment on board with a hook, and a ladder and life jackets. We are trained in the event that somebody is overboard. Scanning with the spotlight, we looked to see if something or somebody was in the water. A ticket agent [Aaron Hutchinson] ran up to the girl and got her, and comforted her and I called Harbor Charlie. We returned to Jersey City to drop people off and by the time we turned around there were police boats here, a helicopter in the sky, the Fire Department was at the wall. It took all of five minutes. They were quick. I lost a couple of friends of mine to suicide this year and it felt good that we diverted it. A guy came towards her and started speaking to her in Chinese and she got down. They had a few words and I think she must have got really aggravated because she started screaming again. I walked away because I thought, a lot of Christmas parties are going on and people might be a little tipsy, and they were having a dispute. But as I walked away she started screaming again and then she collapsed. I went back to her and I said “Ma’am are you okay? What’s going on?” And as I’m helping her get up the man came back again and they were saying something in Chinese but I was holding on to her. And then another girl came, standing next to him, and then he and the girl walked away and got on a boat. The next thing I know the helicopters were over Brookfield Place, and there was a police boat and five or six police cars were coming up the esplanade. As everything was going on, she was just sitting there crying. I don’t know exactly what happened to her. I just know that she was heartbroken. And as we were sitting there talking she turned around and she looked at me and she said, “Thank you very much,” and she gave me a hug, as tight as she possibly can. I hugged her back and I told her “You’re going to be ok.” I say, “Listen, you hear the helicopter?” I say, “Look in the water. You see the police? All of these people are concerned about you.” It put a smile on her face. As time went on and I saw the police were there I felt there wasn’t nothing more that I could possibly do. When I was getting ready to walk away I put my hand up under my chin and I lifted my head up. “Keep your head up,” I said to her. And I got on the boat.